In less than two weeks, the NFL will convene for its annual player selection meeting. To continue our prep work for the draft, you’ll find the fantasy football scouting reports and dynasty rookie rankings for the 2019 wide receiver draft class below. This year’s crop isn’t an elite bunch, but there are several receivers with the potential to be future fantasy standouts. Remember, ranking players is a process that continuously changes as we get new pieces of information. The biggest piece won’t come until late-April when the player is either drafted, signed as an undrafted free agent, or passed over by the 32 NFL teams. For now, all the incoming players exist in a vacuum without a team and can be compared on even ground. 1. D.K. 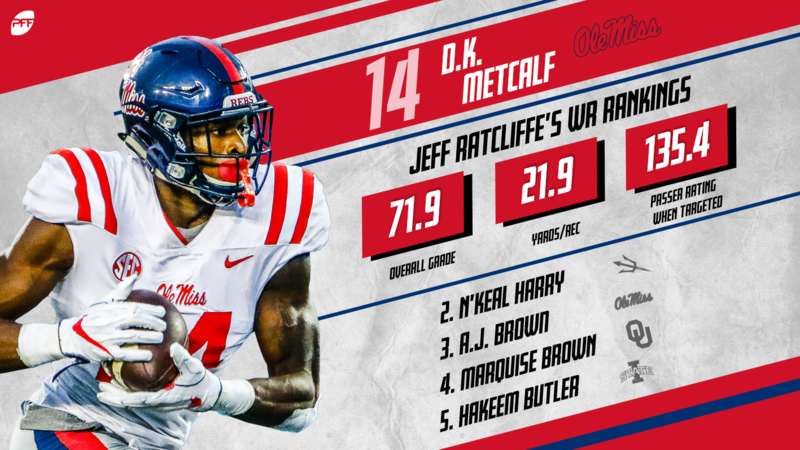 Metcalf, Mississippi — A freakish size/speed prospect, Metcalf is arguably the top dynasty rookie in this year’s class. He comes from a football family with his father (Terrence), uncle (Eric), and grandfather (Terry) all playing in the NFL. Metcalf has size you can’t teach (6-3, 228). He also flashed elite athleticism at the combine with a 4.33 40-yard dash, which was tied for third-fastest among wideouts, to go along with 27 reps on the bench, a 40.5-inch vert, and 11’2″ in the broad. That said, Metcalf also struggled in the 3-cone with the third-slowest time among wideouts at 7.38 and the fourth-slowest short shuttle time (4.50). Still, the big-play ability he displayed at the college level bodes well for future fantasy success. He does enter the NFL coming off a neck injury that cost him half of his 2018 season. Still, he’s a true fantasy alpha who has the makings of being a future WR1. 2. N’Keal Harry, Arizona State — Harry is a big-bodied receiver with the ability to make contested catches thanks to his big catch radius. He proved to be very productive in his three years at Arizona State with 1,000-yard seasons in each of the last two years. He’s also strong after the catch with 15 forced missed tackles last season. Flashed strength at the combine with 27 bench reps. That bodes well for Harry to continue to make contested plays at the pro level, including in the red zone. While Harry doesn’t possess top-end speed, his ball skills and overall profile bode well for future fantasy success. He has the makings of a long-term top-20 option at the position. 3. A.J. Brown, Mississippi — Extremely productive over the last two years, Brown notched 160 catches over that span with more than 1,000 receiving yards in each season. He was extremely efficient last year with 3.01 yards per route run. Brown also led all draft-eligible wideouts with 33 plays of 20-plus yards. While he lined up in the slot 58% of the time on the season, Brown was used almost exclusively on the outside from Week 10 on, which corresponded largely to when D.K. Metcalf got hurt. Brown doesn’t necessarily have the wow factor from a fantasy standpoint, but his game has similarities to JuJu Smith-Schuster. That’s obviously a good thing for his long-term fantasy outlook. 4. Marquise Brown, Oklahoma — Brown isn’t one of the many big-body receivers in this class, but he does have one of the highest ceilings. Last season, he posted a big-time YAC with an average of 8.5 yards after catch per reception and racked up 52 receptions for a first down. Oh, and he’s also cousins with Antonio Brown. The one knock for fantasy purposes is that he lacks prototype size for an outside receiver. Still, his blazing speed and home-run ability give him a similar fantasy profile to DeSean Jackson. 5. Hakeem Butler, Iowa State — Butler is massive (6-5, 227) and very athletic for his size, running an impressive 4.48 40-yard dash at the combine. He really emerged in 2018 with 1,318 receiving yards at a clip of 22.0 yards per to go along with nine touchdowns. He did commit 12 drops on 105 targets, but his targets came heavily downfield with 37 traveling at least 20 yards in the air. Butler’s size, speed and ability to make plays make him an appealing fantasy prospect, especially if NFL teams view him as a No. 1 option. 6. JJ Arcega-Whiteside, Stanford — This is the year of the big-bodied wideout, and add Arcega-Whiteside to that list. He checks in at 6-2, 225 and ran a solid 4.49 40-yard dash time at his pro day. Arcega-Whiteside showed the ability to go up and get the ball with 18 contested catches in 2018. That number ranked fourth in the nation. He was one of just 14 qualifying wideouts to top 3.0 yards per route run. Perhaps most importantly for fantasy purposes, he racked up 14 touchdowns on 63 receptions. Arcega-Whiteside’s height/weight/speed combination bodes well for him emerging as a solid fantasy option at the pro level. 7. Andy Isabella, UMass — Blazing fast but undersized (5-9, 188), Isabella posted a massive 4.16 yards per route run. He also led the nation with 68 receptions for a first down. Isabella ran a 4.31 40-yard dash at the combine, which tied for the fastest time among wide receivers. He also was one of just eight wideouts to run under 7.0 seconds in the 3-cone. Despite his lack of prototype size, Isabella’s speed and ability to do it all as a receiver bode well for his long-term fantasy outlook. He has the potential to become a high-volume PPR option. 8. Parris Campbell, Ohio State — Campbell really emerged in his senior year as Dwayne Haskins’ top target with a team-high 111 targets, catching an impressive 82% of them. Blazing fast, Campbell tied for the fastest 40-yard dash among wideouts at the combine (4.31), led the short shuttle (4.03), and ranked fifth in the vert (40). His 2018 efficiency and off-the-charts athleticism make him a dynasty name to keep an eye on. That said, he doesn’t necessarily profile as a traditional fantasy option at wide receiver. 9. Deebo Samuel, South Carolina — Samuel is built more like a running back, but he proved to be very productive in 2018 with 11 receiving scores. He showed plus ability in short-area movement at the combine with the fifth-fastest short shuttle time (4.14). Samuel dealt with various injuries at South Carolina including hamstring issues that limited him over his first two seasons and a broken leg in 2017. While only 19.6% of his routes came out of the slot last year, he has the makings of a PPR slot option at the pro level. 10. Kelvin Harmon, NC State — Harmon has NFL size (6-2, 221), but lacks speed. He was one of just seven wideouts who didn’t break 4.6 in the 40 at the combine. Still, he was able to make plays at the college level by using his strength in contested situations. He caught 17-of-30 contested targets last year. Harmon also ranked 8th in the nation with 55 first down receptions. While there are some things to like about Harmon’s game, his lack of top-end athleticism will likely translate to a low-ceiling fantasy option at the NFL level. 11. Riley Ridley, Georgia — Calvin’s little brother doesn’t quite have the fantasy appeal of his older brother, but Riley’s physicality and ability to find the end zone (nine receiving touchdowns on 43 catches last season) is appealing. Despite the on-the-field production, Ridley disappointed at the combine with a 4.58 in the 40-yard dash to go along with lackluster numbers in the vert (30.5) and 3-cone (7.22). His family name is certainly going to garner fantasy attention, but the younger Ridley just doesn’t have enough upside to be considered a top-10 fantasy wideout in this year’s class. 12. Emanuel Hall, Missouri — A downfield threat who saw a deep ball on 26-of-58 targets, with a massive 44.8% of his yards coming on these targets. That was one of the highest rates in the nation. Hall also averaged a massive 20.5 yards per catch at Missouri. 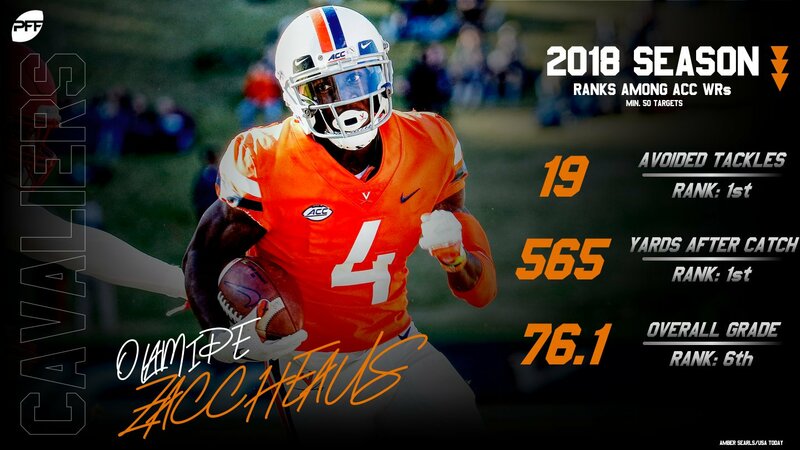 He was one of just seven wide receivers to run under 4.4 seconds in the 40 at the combine, along with tying for the position lead in the vertical jump (43.5) and leading all wideouts in the broad jump (11’9″). For fantasy purposes, Hall profiles as a boom-or-bust big-play option who will likely be best suited to best ball formats. 13. Jalen Hurd, Baylor — A running back over his first three college seasons, Hurd converted to wide receiver after he transferred from Tennessee in 2017. That background could enable him to see added touches at the pro level as a hybrid option. But Hurd isn’t built like a running back at a massive 6-5, 226 pounds, and he displayed good strength at the combine, ranking third among running backs in bench reps with 23. In his lone season as a wideout, Hurd racked up 69 catches for 946 yards and four scores. While he isn’t a pure wideout, Hurd’s size, athleticism, and unique resume make him an intriguing name for dynasty purposes. 14. 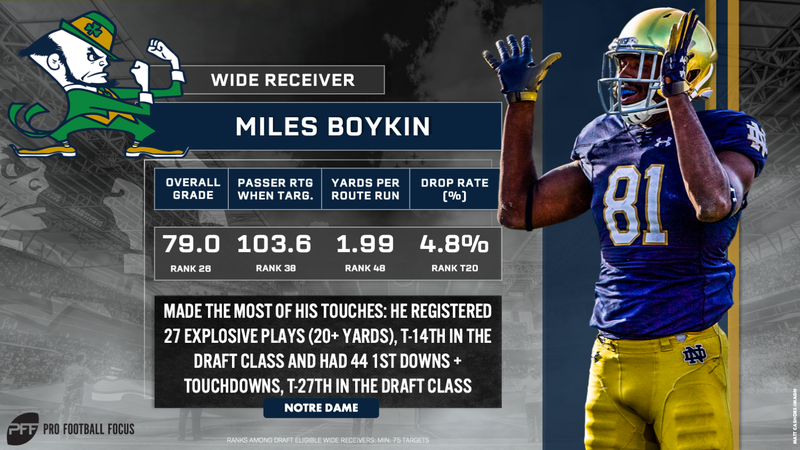 Miles Boykin, Notre Dame — Boykin enters the NFL with a somewhat limited college resume, but he’s arguably the most athletic receiver in the class. He jumped out of the gym at the combine with a massive 43.5-inch vertical and 11’8″ broad jump. Boykin also impressed with the fastest 3-cone (6.77) and third-fastest short shuttle (4.07) among wide receivers. That said, he really only had one season of production at Notre Dame, which came last year. And his 59 catches for 872 yards and eight scores in 2018 don’t really jump off the page. Still, Boykin’s athleticism goes a long way. He’s the most likely candidate to be this year’s fantasy version of Kenny Golladay. 15. Preston Williams, Colorado State — A one-year wonder, Williams put up massive numbers at CSU last year with 96 catches for 1,345 yards and 14 scores. Started his college career at Tennessee, but transferred after the 2016 season. Had an off-field issue in 2017 where he was arrested for an altercation with his girlfriend. Williams also tested poorly at his pro day with a 4.61 40-yard dash and just 31.5 inches in the vert. He has NFL size (6-4, 211), but Williams’ limited college resume and poor testing numbers make him far from a lock for future fantasy success. 16. 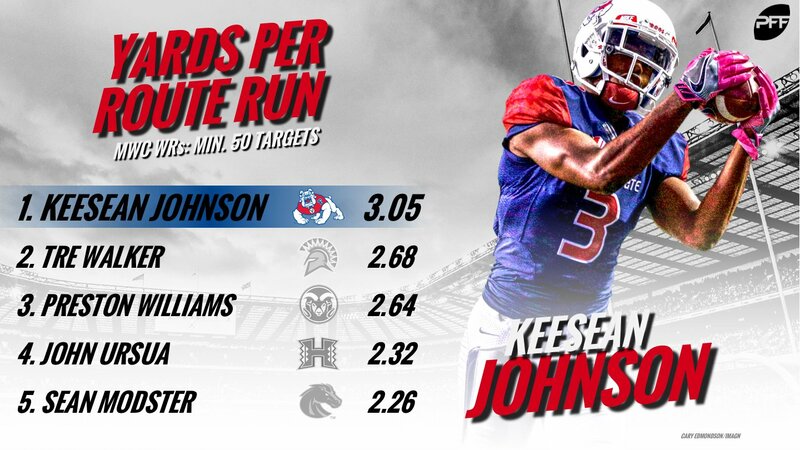 KeeSean Johnson, Fresno State — Johnson is a four-year starter who put up big numbers in 2018 with 95 catches for 1,340 yards. However, it’s important to keep in mind that his production was due in part to the overall lack of receiving options at Fresno State. While he possesses NFL size (6-1, 201), Johnson’s fantasy stock isn’t especially appealing after he ran a 4.60 40-yard dash time and jumped just 30 inches in the vert at the combine. Both were among the worst numbers among wideouts. 17. Darius Slayton, Auburn — Blazing fast, Slayton was one of just seven wideouts to break 4.4 in the 40-yard dash at the combine. He also tied for the third-best broad jump (11’3″) at the position. While the testing numbers certainly pop, we can’t necessarily say the same about his production at Auburn. Slayton caught just 79 balls in three seasons but did post a healthy 20.3 yards per catch. His downfield ability is appealing, but there just isn’t enough fantasy juice with Slayton to consider him a strong long-term option. 18. Anthony Johnson, Buffalo — Extremely productive over the last two years, Johnson notched 133 catches for 2,367 yards and 25 scores. That’s a healthy 17.8 yards per catch. He also comes from a football family, as his cousins are Jadeveon Clowney and Johnathan Joseph. He has good size (6-2, 209), but his 4.55 40-yard dash at his pro day leaves something to be desired. Still, Johnson’s productivity is tough to ignore. He’s a sneaky deeper name to know in this year’s class. 19. David Sills, West Virginia — A former quarterback, Sills is a tall and lean wideout who scored 15 touchdowns in 2018 and 18 in 2017. Despite his size (6-3, 211), he only managed 11 catches on 32 contested targets. Sills didn’t necessarily impress in the combine 40-yard dash with a 4.57, but he did run sub-7.0 in the 3-cone. Sills was uber-productive at WVU, but he’ll need to improve on his contested catch conversions to become a viable long-term fantasy option. 20. Terry McLaurin, Ohio State — Though he isn’t quite as fast as his college teammate Parris Campbell, McLaurin blazed the fifth-fastest 40-yard dash time among wideouts at the combine (4.35). That speed is impressive, but McLaurin wasn’t heavily used at the college level. He scored 11 touchdowns last season, but on just 35 catches. And McLaurin only caught 75 balls over the last three seasons. His wheels are appealing, but McLaurin isn’t a good bet for fantasy success. 21. DaMarkus Lodge, Mississippi — Lodge was a big-time recruit out of high school, but he was overshadowed by A.J. Brown and D.K. Metcalf at Ole Miss. He has NFL size (6-2, 194), but his overall lack of productivity in college puts a damper on his future fantasy outlook. Lodge ran the third-slowest short shuttle time (4.53) among wideouts at the combine. That said, he did manage to post 65 catches for 877 yards and four touchdowns last season. Lodge comes with a solid pedigree, but he’s far from a lock of being a fantasy option at the pro level. 22. Antoine Wesley, TTU — Tall and lean (6-5, 185), Wesley had almost no production entering last season because he was stuck behind Keke Coutee and Dylan Cantrell. But that changed quickly, as he racked up 88 catches for 1,410 yards and nine scores. He caught 17-of-33 contested targets, which bodes well for red zone success. That said, he only managed six reps on the bench at the combine, which was a position low. Wesley also ran a lackluster 4.65 40-yard dash at his pro day. While there are some things to like about his game, Wesley isn’t a strong bet to become a fantasy option. 23. Stanley Morgan Jr., Nebraska — A four-year starter, Morgan is one of the more productive receivers in Nebraska history, having twice set the single-season receiving yards school record. Over the last two years, he racked up 131 catches for 1,990 yards and 17 scores. Morgan impressed in the 3-cone at the combine with a 6.78, which ranked second among wideouts. He doesn’t necessarily wow you in any one area, but Morgan is a solid football player with an outside shot at surfacing on the fantasy radar. 24. Gary Jennings Jr., West Virginia — A special teams option early in his college career, Jennings exploded on the scene in 2017 with a massive 97 catches. His volume decreased last season to just 54 catches, but he was still extremely productive with an average of 17 yards per catch and 13 receiving scores. Jennings tested well at the combine, posting a 4.42 40-yard dash time. His athleticism and solid track record from the college level make Jennings one of the more appealing deeper names in this class. 25. Mecole Hardman, Georgia — A somewhat raw prospect, Hardman only notched 60 catches in three years at Georgia. That said, he’s oozing with upside. Hardman flashed major speed at the combine with a 4.33 40 time, which tied for third among wideouts. If he develops, Hardman’s speed has the potential to lead to major fantasy upside. But there’s also a chance he never surfaces on the fantasy radar. Consider him an upside dart thrown in dynasty rookie drafts. 26. Hunter Renfrow, Clemson — A workmen-like undersized receiver (5-10, 184), Renfrow is a four-year player who finished his college career with 186 catches. More of a possession receiver, he averaged 11.5 yards per catch. Renfrow was one of just five wideouts to not top 10 reps on the bench at the combine, but he did manage the third-fastest time among wideouts in the 3-cone (6.80). He has the makings of a low-upside slot receiver at the pro level. 27. Diontae Johnson, Toledo — A versatile receiver with the ability to play inside and outside in addition to contributing in the return game. Johnson’s most productive receiving season came in 2017 when he put up 74 catches for 1,278 yards and 13 scores. His numbers regress last year but still led Toledo with 49 catches. His 4.53 40 time at the combine is a bit slow for his size (5-10, 183). Still, his versatility gives him some deep dynasty appeal. 28. Greg Dortch, Wake Forest — An undersized receiver who checks in at a just 5-7, 173 pounds, but Dortch was extremely productive last season with 89 catches on 126 targets. He showed good speed at his pro day with a 4.49 40-yard dash. Dortch also displays big-time toughness playing through a puncture small intestine in a game in 2017.Despite his size, Dortch has some deep potential to surface as a PPR option. 29. 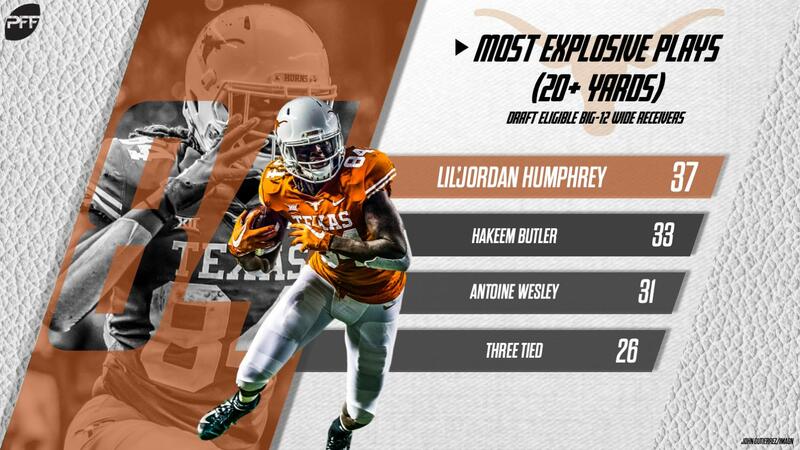 Lil’Jordan Humphrey, Texas — A massive receiver who checks in at 6-4, 220 lbs. Humphrey broke out last season with 86 catches for 1,176 yards and nine touchdowns. Speed is not his forte. Humphrey ran 4.75 in the 40 at the combine, which was the slowest time among wideouts. While he enters the NFL level with a somewhat thin college resume, Humphrey’s prototype size is appealing. That said, he faces a major barrier to fantasy success given his poor testing numbers. 30. Jakobi Meyers, NC State — Kelvin Harmon’s teammate started his career out at quarterback but was moved to wideout in 2016.He took to the position well and racked up 63 catches in 2017.Myers really emerged last year with 92 catches for 1,047 yards. His career yards per catch of 11.5 suggests a possession receiver profile. Myers also failed to display speed at the combine with a lackluster 4.63 40-yard dash time. Meyers has some appeal to his game, but if he does end up surfacing on the fantasy radar it will be as a low-upside option. 31. Cody Thompson, Toledo — A productive receiver who twice topped double-digit touchdowns for a season in college, Thompson averaged a healthy 18.3 yards per reception at Toledo. Tied for the position lead in the short shuttle (4.03), and ranked fourth among wideouts in the 3-cone at the combine (6.87). Thompson projects as a slot receiver who offers minimal fantasy upside. 32. Dillon Mitchell, Oregon — Mitchell is coming off a breakout season at Oregon where he racked up 1,184 yards and 10 scores on 75 catches. He also showed well at the combine with a 4.46 40-yard dash. His versatility should help him find his way onto an NFL roster, but Mitchell doesn’t really wow you in any one area. Like some of his cohort, Williams’ one-year wonder status isn’t optimal for his dynasty outlook. 33. Jazz Ferguson, Northwestern State — Ferguson started his college career out at LSU, but faced a suspension in 2016 for a failed drug test and transferred in 2017.He put up big numbers last season with 66 catches for 1,117 yards and 13 scores. Managed just eight bench reps at the combine, making him one of just five wideouts to not top 10 reps. But he was able to flash speed with a 4.45 40-yard dash time, which is especially fast for his size (6-5, 227). It’s that size and speed that gives Ferguson an outside shot at becoming a future fantasy option. 34. Anthony Ratliff-Williams, North Carolina — An athletic receiver who is capable in the return game. While Ratliff-Williams did show a flair for the spectacular, he only caught 8-of-28 contested targets in 2018.That said, he showed decent speed at his pro day with a 4.49.His fantasy ceiling is intriguing, but Ratliff-Williams enters the pro level much closer to his floor. 35. Tyre Brady, Marshall — Brady started his career at Miami but moved on to Marshall after the Hurricanes changed coaches. He was very productive over the last two seasons with 133 catches and 17 receiving touchdowns. Brady jumped a disappointing 32 inches in the vert at the combine, which fourth-worst among wideouts. He also ran a dreadful 4.74 40-yard dash at his pro day. The testing numbers plus his somewhat raw skill set will make it tough for Brady to become a long-term fantasy option. 36. Terry Godwin, Georgia — A slot receiver who caught 134 balls in four years at Georgia. Godwin wasn’t especially efficient on those catches with just 11 touchdowns. He ran 4.55 in the 40 at the combine. There just isn’t enough juice to get excited about Godwin from a fantasy standpoint. 37. Keelan Doss, UC Davis — One of the top players in the FCS over the last two seasons, Doss put up major numbers with 115 catches in 2017 and 118 last year. Despite the volume, he wasn’t used heavily downfield with a career average of just 12.7 yards per catch. He posted just eight reps on the bench at the combine, but he did run a solid 4.45 40 time at his pro day. Doss will be stepping up in class against NFL coverage, but his size (6-2, 211), speed, and ability make him an appealing deeper name to know. 38. Travis Fulgham, Old Dominion — Despite only having two years of playing experience before college, Fulgham walked on at Old Dominion and worked his way up to a breakout season in his senior year. He racked up 1,083 yards and nine scores on 63 catches last season. He possesses NFL size at 6-2, 215 pounds, but posted a somewhat lackluster 40-yard dash at the combine with a 4.58. Fulgham is a good story, but he isn’t the best bet for long-term fantasy purposes. 39. Ashton Dulin, Malone — A dual-sport athlete who excelled at both football and track in college, Dulin was a playmaker at the Division II level with 20 receiving scores over the last two seasons. His track background showed at the combine where he put up a 4.47 in the 40-yard dash. He also excelled in the return game with three scores last season. Dulin’s speed and versatility are pluses, but like any D-II athlete, the step up in level of competition could prove to be a big challenge. That said, he’s a deep name to keep tabs on for dynasty purposes. 40. Penny Hart, Georgia State — Hart is a smaller receiver (5-8, 180) with good quickness who topped 1,000 yards in both 2015 and 2017.His numbers regressed last season, but this was in part due to poor quarterback play. His quickness out of the slot is appealing, but Hart projects as a low volume option if he’s able to carve out a spot on an NFL roster. 41. Nyqwan Murray, Florida State — An undersized receiver (5-10, 191) who failed to stand out in his testing numbers at the combine. Murray had just eight bench reps at the combine, which was tied for third-lowest among wideouts, and he posted the worst broad jump (113). Murray projects as a slot receiver at the next level, which means minimal fantasy upside if he’s able to carve out a role on an NFL roster. 42. Ryan Davis, Auburn — The Auburn single-season catch record holder (84 in 2017), Davis enters the draft with a possession receiver profile. He averaged just 7.9 yards per catch last season and 8.7 for his college career. He also posted a slow 4.63 40-yard dash time at his pro day. Davis doesn’t figure to surface on the fantasy radar. 43. Jamal Custis, Syracuse — A one-year wonder, Custis is coming off a 51-catch campaign after having recorded just 13 receptions in his first three seasons at Syracuse. But he did perform well last year with 906 yards (an average of 17.8 per) and six touchdowns. He possesses good size (6-4, 214) and managed a solid 4.5 40-yard dash time at the combine. Custis is worth monitoring in deep dynasty leagues. 44. Jaylen Smith, Louisville — Lamar Jackson’s playmaker, Smith scored a combined 13 times over the 2016 and 2017 seasons. He also averaged a massive 22.2 yards per catch in 2016. However, his numbers regressed without Jackson last season. Smith posted a 4.47 in the 40-yard dash at the combine but also ran the slowest 3-cone time among wideouts at (7.55). He doesn’t project to be a fantasy factor. 45. Olamide Zaccheaus, Virginia — An explosive player with track speed, Zaccheaus caught 85 balls in 2017 and 93 last season. He also found the end zone nine times in 2018. He’s undersized (5-8, 188), and somewhat unpolished. But Zaccheaus has major playmaking ability. That said, his size and lack of refinement as a receiver make him unlikely to ever become a fantasy option. 46. Emmanuel Butler, Northern Arizona — A productive FCS receiver who twice topped 1,000 receiving yards and scored a combined 24 touchdowns in 2015 and 2016. Injuries hampered him in 2017, but he returned to average 19.3 yards per catch last year. 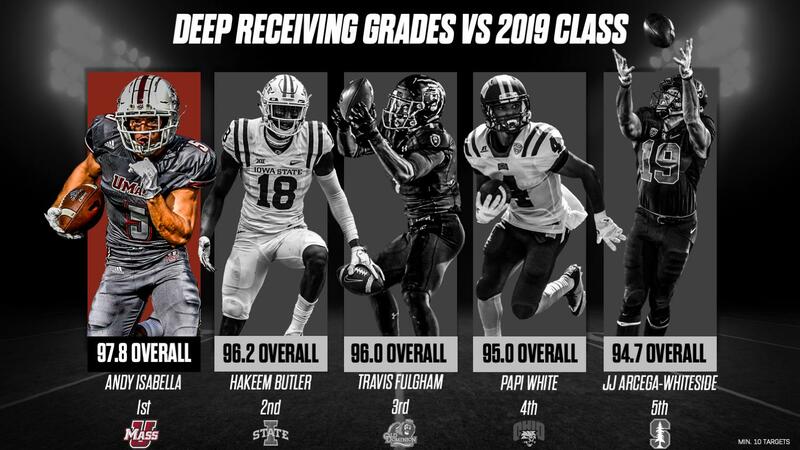 Butler failed to impress with his testing numbers at the combine, especially in the broad jump where he ranked second-worst among wideouts at 9’7″. That said, Butler did run a reported 4.48 40-yard dash time at his pro day. That speed plus Butler’s size (6-3, 217) make a deeper name to know. 47. Olabisi Johnson, Colorado State — Johnson took a back seat to Michael Gallup and Preston Williams at CSU, but he’s coming off a solid 2018 campaign where he racked up 54 catches for the Rams. He also contributed in the return game. Johnson showed good short-area quickness at the combine with the fifth-fastest 3-cone time among wideouts. Johnson’s versatility could get him on a 53-man roster, but he’s unlike to be a fantasy option at the pro level. 48. Alex Wesley, Northern Colorado — Wesley enters the NFL draft process with 1,000-yard seasons in each of the last two years. His 7.40 was the second-slowest 3-cone time among wideouts at the combine, but long speed isn’t an issue for Wesley. He won the 400-meter outdoor title three-times in the Big Sky Conference. Still, he’ll be stepping up in class that the NFL level and is a bit of a longshot to hit for fantasy purposes. 49. Jeff Smith, Boston College — Despite being generally unproductive at Boston College, Smith has risen up draft boards after testing extremely well at his pro day with an impressive 4.34 40-yard dash time. Over the last three seasons, Smith caught just 72 balls, though he did average 15.0 yards per reception. Still, his limited numbers don’t bode well for Smith emerging as a viable fantasy option. 50. Scott Miller, Bowling Green State — The leading receiver at Bowling Green in each of the last three seasons, Miller flashed major speed at his pro day with a 4.39 in the 40-yard dash. He’s also coming off a solid 2018 campaign where he averaged 16.2 yards per catch and racked up nine touchdowns. Miller’s speed gives him a puncher’s chance, but his size (5-9, 174) will make it somewhat tough for him to surface on the fantasy radar. 51. Felton Davis III, Michigan State — Davis suffered a torn Achilles in October and is still recovering. While he didn’t run the 40 at the combine, he was one of just five running backs at the combine to top 20 reps on the bench with 21. He possesses NFL size (6-3, 211) and posted solid production at the college level. That said, he’s still in the midst of a tough recovery. 52. Jovon Durante, FAU — An undersized outside wide receiver who checks in at just 5-11, 160 points. Durante started his college career at West Virginia but transferred to FAU for the 2018 season. He didn’t test well at the combine, posting the third-worst vertical jump (31.5) among wideouts. He’s unlikely to be a future fantasy option. 53. Jonathan Duhart, Old Dominion — Productive receiver who scored 28 times over the last four years at Old Dominion. Put up 74 catches for 1,045 yards last season. He’ll try to follow Zach Pascal’s lead to the NFL but is unlikely to ever surface on the fantasy radar. 54. Brody Oliver, Colorado School of Mines — A small-schooler who put up massive production at the college level. Oliver scored 26 receiving touchdowns in 2016. You read that right. He then scored another 31 times over the last two seasons. Oliver has good size (6-3, 208) and he ran a 4.45 at his pro day. While those numbers are certainly appealing, the step up in class will be a major barrier for Oliver. 55. 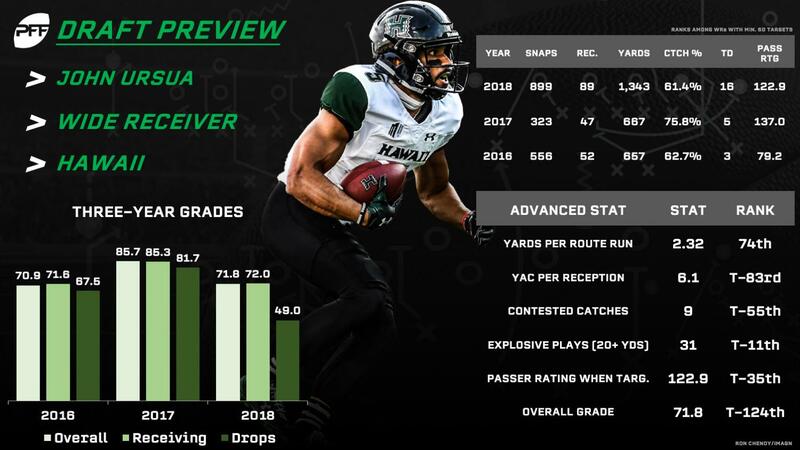 John Ursua, Hawai’i — Ursua broke out in a big way last season with 89 catches for 1,343 yards and 16 scores. That’s solid production, but Ursua doesn’t check NFL boxes from a size (5-10, 175) or speed standpoint. He ran just 4.58 in the 40-yard dash at his pro day. 56. Tyron Johnson, Oklahoma State — Johnson didn’t put up big-time numbers at the college level with just 80 catches in three seasons. However, he’s a deep name to know simply for the fact that he ran a 4.34 40 time at his pro day. 57. Jalen Guyton, North Texas — A speedy wideout who ran in the low 4.4s in the 40-yard dash at his pro day. Guyton started his college career at Notre Dame, but left after his first year. In two seasons at North Texas, he averaged 15.3 yards per catch and posted 15 touchdowns on 103 catches. His speed is appealing, but Guyton doesn’t project as a likely dynasty option. 58. Johnnie Dixon, Ohio State — Yet another fast Ohio State wideout in this year’s class, Dixon ran a 4.41 40-yard dash at the combine. Though lightly used, he managed to find the end zone eight times in each of the last two seasons. That’s on just 60 catches. His big-play ability as a deep threat is intriguing, but one-trick ponies typically aren’t good fantasy options. 59. Kelvin McKnight, Samford — A smaller receiver (5-8, 185) who was wildly productive at the FCS level with 312 catches for 4,121 yards and 32 touchdowns over his career. McKnight ran just 4.62 in his pro day 40, but he did flash quickness with a 6.98 3-cone and explosion with 39.5 in the vert. He’s certainly a fantasy long-shot, but his college production at least gives him an outside chance of surfacing in deep leagues. 60. Jon’Vea Johnson, Toledo — The son of former NFL wideout Jason Johnson, Jon’Vea Johnson is coming off a 2018 season where he averaged a massive 21.1 yards per catch. That said, he only snagged 29 balls on the season. Still, Johnson is an intriguing name after he went sub-4.4 in his pro day 40-yard dash along with a quick 6.68 3-cone time. He’s worth keeping tabs on in deep dynasty leagues. 61. Reggie White Jr., Monmouth — Extremely productive at the college level, White racked up 249 catches for 3,373 yards and 31 scores at Monmouth. White has good size (6-2, 208) and posted impressive testing numbers at his pro day with a 4.45 40 time, 6.77 in the 3-cone, and a 37.5-inch vertical. He’s a dark horse name to know in deep dynasty. 62. Shawn Poindexter, Arizona — Poindexter scored 11 receiving touchdowns as a redshirt senior last season. He has good size (6-4, 212) but managed just 4.68 in his pro day 40-yard dash. 63. Terry Wright, Purdue — Lightly used in his two years at Purdue, Wright caught 57 passes over the last two seasons. However, he flashed plus athleticism at his pro day with a 4.44 40-yard dash, 6.77 in the 3-cone and 128 inches in the broad jump. 64. Cortrelle Simpson, Richmond — Simpson starter his college career at Temple, but saw action in just nine games over his first two seasons. He transferred to Richmond in 2017 and proceed to rack up 60 catches for 1,1019 yards and six scores. His numbers regressed last year. Simpson ran a reported 4.50 40 time at his pro day, and checks in at an undersized 5-9, 187 pounds. 65. Juwann Winfree, Colorado — A hybrid wideout/defensive back, Winfree caught 49 balls at Colorado over the last two seasons. He started his college career out at Maryland in 2014, but only played one season there. 66. Nick Easley, Iowa — Easley notched 103 catches over the last two seasons for Iowa, but only managed 9.9 yards per catch. He doesn’t possess prototype size (5-11, 205) and ran a 4.54 40-yard dash at his pro day. 67. Ventell Bryant, Temple — Bryant is a four-year player, but he wasn’t heavily used at Temple. His top season came in 2016 with 54 catches for 895 yards and four scores. He has size you can’t teach (6-3, 209), but Bryant really doesn’t stand out in any one area. 68. Dredrick Snelson, UCF — Undersized at (5-11, 189), Snelson caught 106 balls in three seasons at UCF. His lack of size and lackluster testing numbers at his pro day (4.55 40 time) don’t bode well for success at the NFL level. 69. Jesper Horsted, Princeton — Horsted was productive for the Tigers with over 1,000 receiving yards in each of the last two seasons. He racked up 164 catches and 27 scores over that span. Those numbers are impressive as is Horsted’s size (6-4, 229). Unfortunately, he posted lackluster testing numbers at his pro day, especially in the 40 where he ran a slow 4.71. 70. DJ Montgomery, Austin Peay — Small-schooler who went the junior college route before landing at Austin Peay. He racked up 10 touchdowns and notched a 19.0 yards per catch in 2018.Montgomery also put up solid testing numbers at his pro day with a 4.43 40-yard dash and 6.69 in the 3-cone. Despite those testing numbers and his 2018 production, Montgomery is a big-time long-shot to ever surface as a fantasy option. 71. Jamarius Way, South Alabama — A big-bodied receiver (6-3, 215) who notched 108 catches for 1,617 yards and 11 scores over the last two seasons at South Alabama. While he plays strong, Way does not have pro-ready speed. He ran slow times in the 40-yard dash (4.63) and the short shuttle (4.66) at the combine. He’s unlikely to ever be a fantasy option. 72. Justin Sumpter, Kennesaw St. — Small-schooler who was a four-year starter for Kennesaw State. He posted impressive numbers in the vert (39.5) and broad jump (125) at his pro day but also ran 4.66 in the 40-yard dash. Sumpter isn’t going to be a fantasy option. 73. Marcus Green, Louisiana-Monroe — Green is an undersized (5-8, 190) multi-purpose player who did a bit of everything at Louisiana-Monroe. Green caught 202 balls over the course of his career, with solid averages of 15.0 and 17.1 yards per catch over the last two seasons. He flashed major speed at his pro day with a blazing 4.39 40-yard dash time. He profiles more as a special teams option if he’s able to catch on with a team. 74. Trey Brock, Hillsdale — An extremely productive wideout who racked up 4,401 yards and 40 touchdowns in 256 catches at the college level. Of course, he did so against Division II competition. Brock has NFL size (6-3, 212), but the major step up in class at the NFL level makes him a big-time long shot to surface on a 53-man roster. 75. KaVontae Turpin, TCU — Turpin peaked from a statistical standpoint in his freshman year with TCU when he put up 45 catches for 649 yards and eight scores. His numbers regressed in the following three seasons. That said, he did run a blazing fast 4.31 40 time at his pro day. 76. Shun Brown, Arizona — Brown emerged over the last two seasons with 12 combined touchdowns on 107 catches. But he’s undersized (5-8, 185) and ran a dreadful 4.72 40-yard dash at his pro day. 77. Trevon Brown, East Carolina — Extremely productive over the last two seasons, Brown topped 1,000 receiving yards both years with a combined 134 catches and 16 scores. Despite the production, he isn’t on the dynasty radar. 78. Flynn Nagel, Northwestern — A four-year player at Northwestern, Nagel profiles as a possession receiver with just 11.0 yards per catch and six touchdowns in his career. He tested poorly at his pro day with a 4.71 in the 40 to go along with 28.5 inches in the vert and 106 inches in the broad jump. 79. Xavier Ubosi, UAB — Ubosi had a solid season last year with 35 catches for 837 yards and eight scores, but those numbers aren’t special enough to warrant dynasty consideration. 80. Steven Sims Jr., Kansas — A four-year player who profiles as a slot option. Sims averaged 12.1 yards per catch at Kansas. He measured in at 5-9, 184 at his pro day and ran a 4.50 in the 40-yard dash.